Location: located in a 98-foot-high plateau in Yarnaz Valley, about 13 miles west of Turpan, Xinjiang Uygur Autonomous Region. - CNY126 for a 6H combined ticket. How to get there: take buses No.1 or No.101at Xincheng Road (新城路, New City Road), get off at Yarnaz Valley, and then take miniature taxi (2CNY/person), pedicab (3CNY/person), taxi (15CNY) or wagon (20CNY). 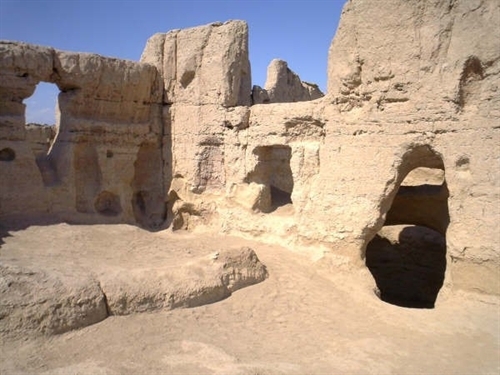 Located in a 98-foot-high plateau in Yarnaz Valley, about 13 miles west of Turpan, Ancient City of Jiaohe (also known as Yarhotto) of Xinjiang Uygur Autonomous Region is viewed as one of the world's largest, oldest historic sites and the best preserved raw soil buildings with more than 2,000 years. 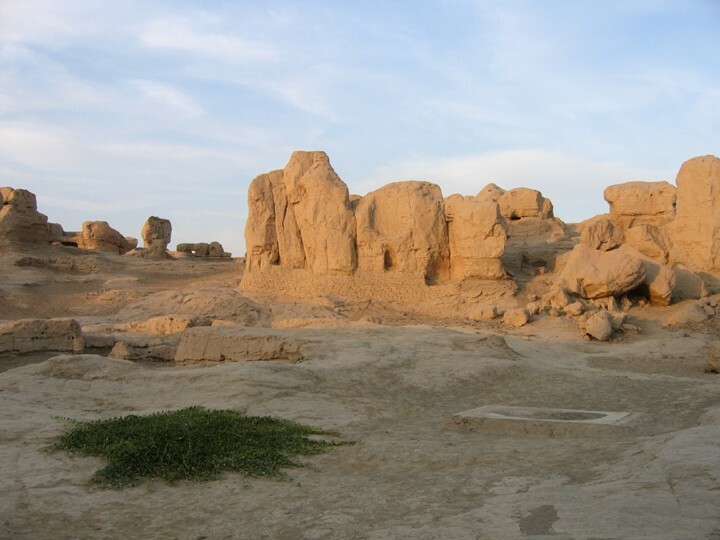 In Tang Dynasty (618-907), it was the capital of the state of South Chechi and the political, economic, cultural and military centre. 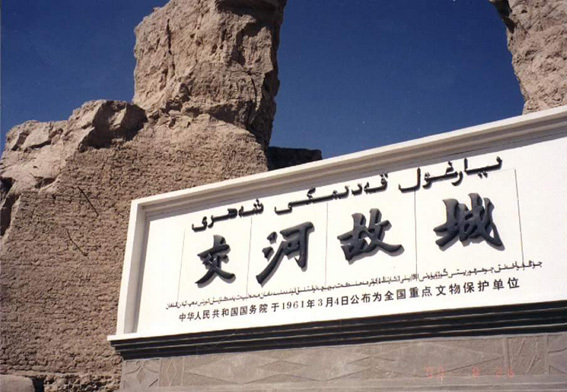 In 1961, it was listed as one of the country's key protected cultural sites in China. 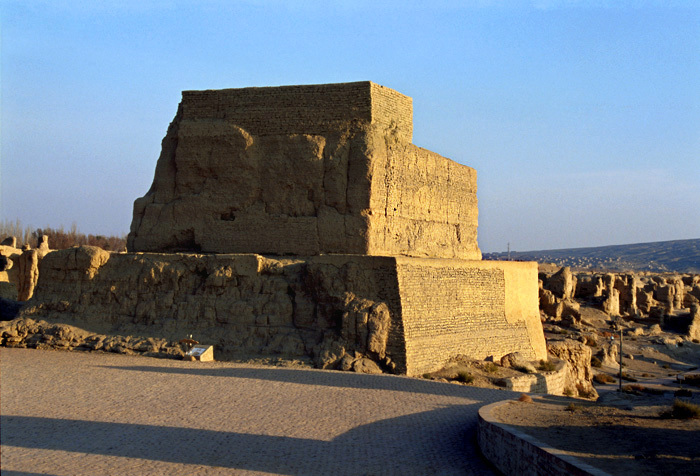 Ancient City of Jiaohe can go back to the second and the fifth century BC. 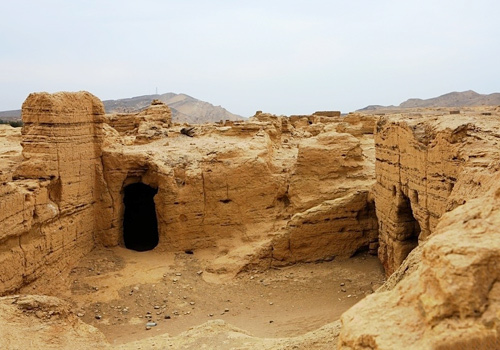 It has remained a decade-long period of prosperity in Northern and Southern Dynasties (420-589) and Tang Dynasty, then was damaged during the 9th and the 14th centuries because of wars. 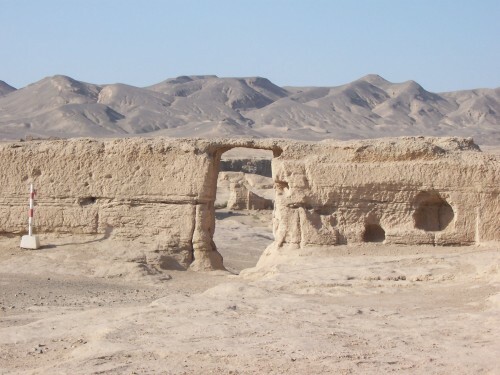 Due to years of fighting and wars in Turpan at the end of Yuan dynasty (1206-1368), the place has fallen into crumbling and was deserted at last. Occupying an area of 47,000 square meters, including 36,000 square meters historic zone, Ancient City of Jiaohe stretches some 1,600 meters from south to north and 300 meters east to west. 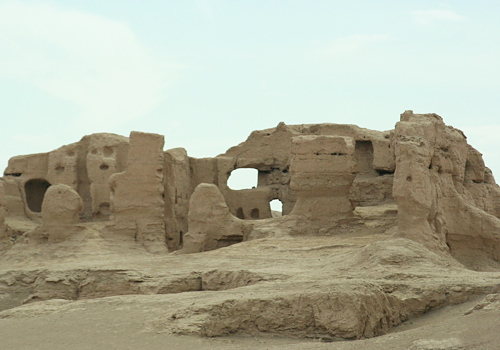 Buildings were mostly built in Tang Dynasty and distinctive in style. As a result of lacking of rain, Ancient City of Jiaohe is in an excellent state of preservation. 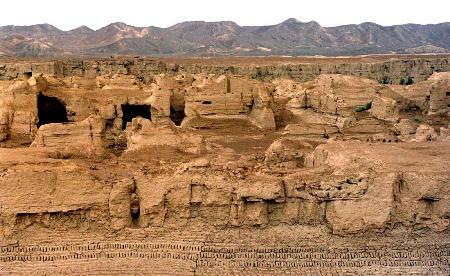 The architectural characteristics of the central plains of China before Song Dynasty (960-1276) can be seen in the city. All buildings were constructed by stamping earth between board frames. What is more, its pattern of city layout is similar to the capital of Tang Dynasty, Chang'an City (present Xi’an). Inside the city, the streets, residential quarters, temple with 5,000 square meters, 101 stupas, training ground and workshops all preserve their ancient Tang styles. It is like a willow leaf when overlooking the whole city. 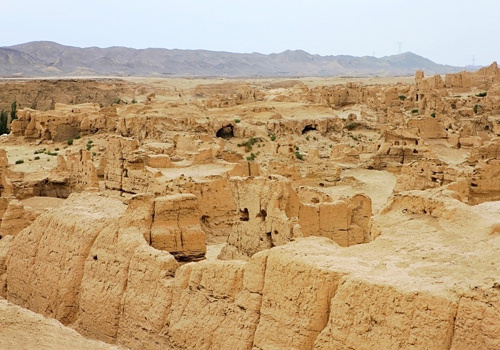 Thanks to the natural conditions for being drought and short of rainfall, the Ancient City of Jiaohe is still well preserved miraculously after going through millennium vicissitudes. Served as a large fortress with great value of defensive positions, the city is situated in the high place by facing cliffs in all directions and affords a comprehensive and commanding view. Gates were built on the cliffs of the east, west and south sides respectively. Three sections make up the city. The dwelling district is divided into eastern and western regions by a 350 meters long and 10 meters wide road from south to north. A grandiose temple stands on the north end of road. The northern section, which spreads over 90,000 square meters, centers around this temple where the places worth visiting are cluster of stupas. A variety of handcraft workshops scatted in residential district. Thick and high walls are standing plumb on both sides of the road without doors and windows. These crossed and entangled streets, like what the style in the cities of ancient China, implying that the city has been rebuilt completely during Tang Dynasty and hardly find any marks left before Tang Kingdom. The combination of traditional architecture from central plains of China and local building style can be reflected via its city layout. Guided with the purpose or military defense, the city was constructed into a large fortress which reveals the tense ethnic and social contradictions within the area in history. It may be difficult to believe, but most of buildings in this city were built by digging the high ground surface. Raw soil features the temples, city gates, streets and roads etc. In other words, the city is a wonderful and giant ancient sculpture, which fully represents the great intelligence and powerful creativity of ancient people. The beauty of Ancient City of Jiaohe is unique in the world. The ancient city was remote from the outside world for centuries and just received much concern in recent years because of a painting. More than 20 years ago, an ink painting named Ancient City of Jiaohe, which painted by Wu Guanzhong (吴冠中, 1919-2010, a famous artist of modern Chinese painting), was sold with a sky-high price CNY40,700,000 at auction. The price has reached a new high for mainland artists of traditional Chinese paintings during that time and began to attract world-wide attention. Known as the most perfect ruins in the world, it provides abundant resources and great value for historic and cultural research.